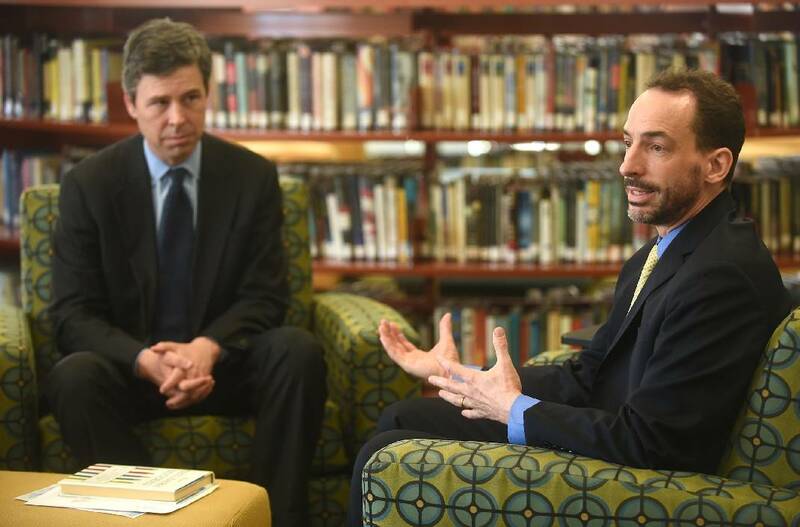 Author Paul Tough, right, speaks about his book as Mayor Andy Berke listens Monday in the Baylor School library. High test scores and intellect are not the only factors determining a child's success. Educators should also focus on inner traits like character, perseverance, curiosity, self control and grit, according to one expert. "What scientists and educators are finding out is that there are another set of skills that matter at least as much," said author and journalist Paul Tough. "We know less about how to nurture them, how to teach them to kids. But we need to put more focus on them." Tough, a contributing writer for the New York Times Magazine, spoke Monday at Baylor School as part of the Baylor Parent Alliance Speaker's Series. He has written extensively about education, parenting, poverty and politics, including stories on character education, the achievement gap, and the Obama administration's poverty policies, according to his website. Tough explains his reasoning about character and perseverance in his latest book, "How Children Succeed: Grit, Curiosity, and the Hidden Power of Character." He also wrote "Whatever It Takes: Geoffrey Canada's Quest to Change Harlem and America." Baylor School Headmaster Scott Wilson said Tough's message is consistent with what many people believe, that there is a link between success and character. However, Tough offers science to back it. "That makes it all the more compelling," Wilson said. "The main message is that in addition to the intellectual skills that we tend to focus on," Tough said, "the cognitive skills we tend to focus on these days, the sorts of things that can be measured on standardized test, there is this dimension of skills and abilities that children have that are sometimes called non-cognitive skills, sometimes called character strengths." Mayor Andy Berke was so impressed with Tough's first book, "Whatever It Takes," he used principals in the book to launch his own Baby University in early summer 2015. Baby University provides 55 families in the East Lake and East Side area with a mentor to advise them on discipline and child rearing and also to make sure the mother gets regular prenatal doctor visits so she will deliver a healthy baby with a normal body weight. Berke started Baby University after seeing the state's high infant mortality rate. He wanted to give youth a better chance at being successful at school. The program marks a year of existence this summer. Berke plans to evaluate the program and determine if he will expand it to other communities.